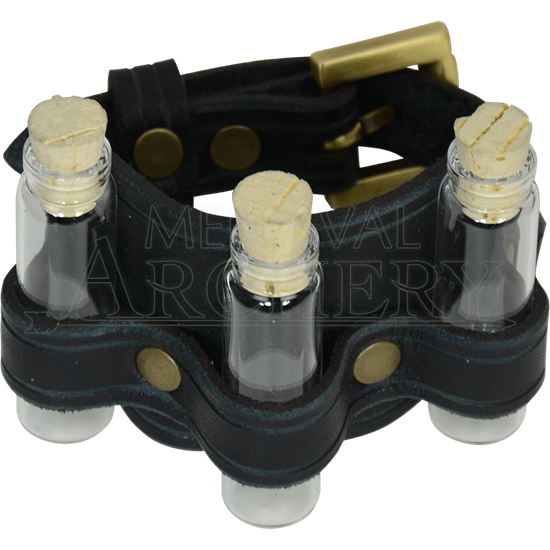 Life in a medieval or fantasy world can be a pretty hectic thing and you never know when carrying a few bottles, conveniently pre-filled with a choice potion or brew, might be a life-saver, and that is why this Three Bottle Leather Cuff is so useful. There are hundreds of uses that you might put these bottles toward, making them quite the versatile little set. Strap this arm band to your wrist or arm and fill these little potion bottles with the (implied) essences of life and magic and you will have a nice little pick-me-up that will get you back up and fighting after a wound has put you down for the count! Of course, that is just one potential use. You can even leave them empty, as they look great filled or not (and are darn convenient when it comes to having a little bottle on hand). The band is crafted from high quality leather and features a trio of little square shaped bottles, each of which feature their own cork closure and are perfectly safe for filling, using, and drinking from (although we recommend you wash the bottles prior to and after each use). A riveted band holds the three bottles securely in place, while also ensuring that they are just loose enough to be easily removed with a tug or a yank. The band features an attractive buckle closure, which gives the arm band some measure of adjustability, too, allowing virtually anyone to wear these three potion bottles on their arm or wrist. The wrist band measures approximately 11 inches long, while each bottle measures 2 inches tall and 0.5 inches wide. The Three Bottle Leather Cuff is one accessory that works well with any profession and any look, if only because everyone can benefit from it. Wizards, warriors, rogues, knights, and more can all enjoy the perks of having a convenient potion, poison, or healing draught that is cleverly kept within reach at all times. You guys are a life saver - my 12 year old - too old for "toys" too young for clothes. Had a very happy birthday - loved everything. I love how you call when you don't have an item in stock and we can talk over options. Great customer service!